Fortnite season 5 added three major areas to the map: Paradise Palms, Lazy Links and the colloquially named Viking Village. Those are just the big-hitters, though. 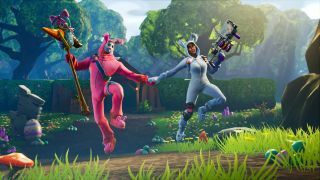 The new season also introduced a wealth of interesting tidbits and Fortnite Easter eggs that are easy to miss, so we've rounded up the best ones for you here. Durrr Burger's mascot was one of many icons lost to the Fortnite rifts of season 4, so fans were happy to see him back in the official trailer for season 5. The big-ol' burger can now be found northwest of Loot Lake, sporting some new Drift graffiti. You can also glimpse his glorious form dangling from the rear-view mirrors of the new golf carts. The neon sign for Noms Supermarket has also returned from the void, but while Durrr Burger got a nice perch overlooking Loot lake, the Noms sign is now half-buried in the hills northeast of Risky Reels. It's not exactly a star attraction, but it's worth swinging by for the chest that spawns right behind the sign. Season 5 has done more than rearrange things, mind. We've also got some brand new residents in the desert area surrounding Paradise Palms. Follow the roads southeast and you'll find three massive dinosaurs: a green T-Rex, a red Triceratops, and a purple Brontosaurus. What's interesting is that the former two dinos have already been turned into skins, respectively Rex and Tricera Ops, leading some to believe that some sort of Brontosaurus cosmetic is on the way. Finally, there's one more secret hidden in the desert. You've probably seen the race track northeast of Paradise Palms, and you may have tried driving along it, but have you ever properly raced it? Park a golf cart at the finish line—look for the lines marking where to park—and the racing lights will kick on. Once the light's green, rings will appear on the track for you collect, and when you finish a lap, your time will be recorded. This makes it easy to race your friends, and again, you can bet on this being tied to a challenge later on. While you're racing, you may notice that the drift on Fortnite's golf carts works just like the drifting in Mario Kart: as you drift, you build up a speed boost that gets more powerful the longer you drift, from blue to yellow to red. This makes drifting the best way to maintain your speed, whether you're racing in the desert or racing against the Storm Eye. If you missed the greatest (and most tragic) rescue mission Fortnite has ever seen, go catch up on the story of Chappadoodle. Here’s the short version: they fell down a cliffside near the edge of the map, stuck on a small shelf overlooking the ocean. Another player attempted to rescue them, only for things to go about as poorly as they could. The video went viral, and in the next update, Epic added a gravestone to memorialize the event. RIP, Chappa.